Shabbat services are held on Fridays from September through June and led by members bi-weekly during the summer. Services generally begin at 7:30 p.m., although one service per month begins earlier and places special emphasis on material of interest to children. Saturday morning services held in conjunction with bar/bat mitzvahs tend to be formal in nature. For an up-to-date listing of services for this month, please check the calendar. Our services vary widely in format and content, ranging from fairly traditional Shabbat rituals to a variety of less structured observances. Services may draw on holiday themes, Jewish music and dance, Jewish mysticism and philosophy, historical events, contemporary social issues, poetry, healing, meditation, or other sources of spiritual and personal enrichment in our search for a rich and balanced Jewish life. 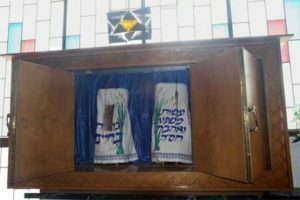 Temple Emanuel uses the Union for Reform Judaism’s Mishkan Tefillah for Shabbat.